This is another one brought to me from my friend in North Carolina. It is from a local grocery chain there based out of Salisbury, NC, and the root beer bears the same name as the store. Food Lion has it's own line of generic products in all varieties, much like Kirkland or Kroger. So going into this, i wasn't expecting much more than a generic root beer from a grocer, much like many other stores have done. That being said, their isn't much back story or information i can dig up on this one that isn't completely irrelevant or boring. So i'll skip all that. This root beer was brought to me in a can, as were several of the root beers my friend brought me from North Carolina. I suppose they are easier to pack into a suit case that way. But regardless, i doubt it comes in a glass bottle anyway. The label is a bit drab, but typical of a generic. Very few colors, just white and a few shades of brown, with a basic design showing the logo of the store (which somewhat resembles a family crest or insignia) and some circles and swooshes which can either be considered a new age kind of look symbolizing carbonation bubbles or something, or it could be a throwback to the 70's style designs. Could go either way really, but if i were you i wouldn't look to far into it. 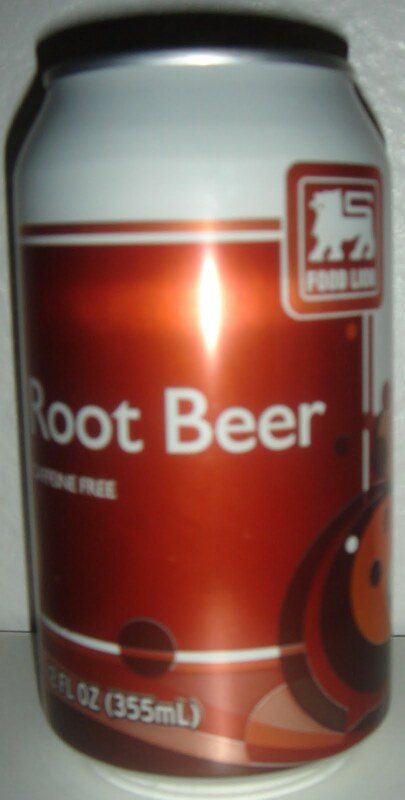 It's definitely a generic root beer, and as such follows by having a lack-luster taste. It's fine. Some may say sufficient. But it definitely doesn't stand out. I would say it does it's best to mimic A&W like so many others do. And like i always say, if you're going to copy a root beer flavor, you might as well copy a successful one. Food Lion can't quite capture the true taste though. The initial taste is solid, very strong and sweet with good carbonation, but that fades very quickly to basically tasting like water. It's not bad, but definitely not good. My official review is that Food Lion Root Beer gets 4 (four) IBCs. I suppose the appeal to this one is the low cost per unit, as is the case with most generics. And if that's the only draw, i say just get whatever generic is available to you (except Shasta or Big K, they aren't very good). There are no Food Lions here in Arizona, so i don't have regular access to their root beer. And i don't really know how common they are outside of North Carolina, but i wouldn't travel too far just to get the taste of their root beer. When it really comes down to it, this one's pretty unsatisfactory. So i stumbled on to this one almost by accident when i met a friend to get some ice cream at Culver's, which is mostly known for their concrete mixers (which is basically just like a Dairy Queen Blizzard). Anyway, when i met him at the local Culver's, he told me that the fast food restaurant chain makes its own root beer, and as a result i was able to review a root beer i wasn't aware of. Craig Culver opened his first restaurant in 1984 in Wisconsin by converting an old A&W stand, which makes me think he has been making root beer from the very beginning, though i have no documentation of that. However, using my superior root beer knowledge, judgement, and wisdom i will say that must be true. Makes logical sense. I always drive past the Culver's here and confuse it with Carvel's, an east coast ice cream cake shop famous for Fudgie the Whale and other ice cream cake concoctions. So it never dawned on me to stop in and get some food, let alone see if they make their own root beer. I can't really judge the packaging on this one, as it is clear from the picture that i made the label on the cup by pasting a picture of the label from the soda fountain (and it looks quite poorly executed at that). I doubt they bottle this root beer, but i may be wrong. It was easiest just to do it this way, and if i am being completely candid, i have plans to make my own label in a similar fashion for another root beer which i have yet to review. That one, however, is in a bottle, just without a label. So i won't hold any points in favor of or against this root beer for the packaging. It's just standard fast food fare as far as cups and lids and straws goes. My friend, whom i have consulted with on root beers in the past, informed me that this root beer was pretty good. And he's right. It is pretty good. Quite creamy tasting and well carbonated, it has a good root beer taste. You would think it would taste like A&W since the first restaurant was converted from an old A&W stand, but i think it tastes more like a creamy version of Mug Root Beer. It's similar, yet distinct. But in any case, it's a good root beer, and the food and concrete mixers at Culver's aren't half bad either. Overall, i had an enjoyable experience. My official review is that Culver's Gourmet Root Beer gets 7 (seven) IBCs. It's a really good root beer. Maybe even worth an 8 considering i just got it out of a soda fountain and couldn't experience it in a glass bottle the way the root beer gods intended. So if you find yourself near a Culver's (not sure how nationally dispersed the franchises are), stop in and grab a bite to eat and wash it down with some of their delicious root beer. what root beer are you looking for? To whom it may concern... It has been brought to my attention that there are several websites out there for root beer reviews. Don't believe me? Just google "root beer reviews" and you'll see what i mean. My frustration with this is that one common theme you will find with these sites is that the people who create and update them are self appointed "root beer experts", with little other credentials than just saying they know what they're talking about. Well guess what... they don't, and coincidentally, i do. Therefore, i am creating the only root beer review site you will ever need to visit because my opinion is absolute and extremely biased, just as you would expect from someone who should tell you what root beer is good and what is worth skipping. Now i know that people are entitled to their opinions, but you should just know that i am also entitled to my own opinion, and my opinion is that your opinion is clearly wrong. So you should just listen to me. Don't argue. Don't fight it. In fact, if you have any complaints, i suggest you send them to my e-mail address: idon'tgiveacrap@yahoo.com. Enjoy the reviews! And if you don't, don't come back to my blog. Because nothing can ever match the caliber of IBC, each root beer reviewed will be based on a scale of 0 to 10 IBCs.